Conor McGregor will face late-replacement Nate Diaz in the main event of UFC 196 on Saturday night at MGM Grand Garden Arena in Las Vegas. Who will win the fight? This article contains our betting preview on McGregor v Diaz fight with tips, best odds, free bets and no deposit bonuses! An injury to lightweight champion Rafael dos Anjos has prevented McGregor from having the opportunity to become the first man to ever hold two UFC titles at the same time as the Brazilian fractured his foot during sparring. McGregor has taken the UFC by storm, surging through the card to a 7-0 record in less than three years. Last time out, the Irishman took only 13 seconds to end Jose Aldo’s 10-year unbeaten run in just 13 seconds to become the new UFC featherweight champion of the world. Prior to that fight, the "Notorious" defeated Chad Mendes at UFC 189. 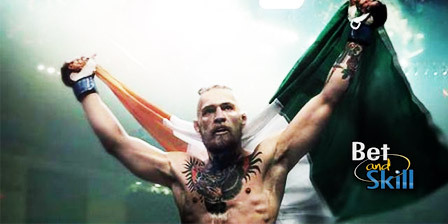 The Irishman is immensely powerful, owning a knockout rate of 81 percent in his career and 86 percent in the UFC. His cage-cutting footwork is excellent, but he's nearly as effective operating in open space and letting his opponent come to him. Defensively, he can be hit but his chin is rock solid and no opponent has been able to hurt him on the feet. Heavy-handed Chad Mendes hit him with several hard punches and he did not flinch. His takedown defense has been fine. He struggled a bit against Chad Mendes, though the knee injury he suffered before the fight was reportedly to blame. Nate Diaz (18-10) is a veteran of the UFC. One of Stockton’s finest, he has 11 wins by submission and another four by knockout. Anyway, he lost a unanimous decision to dos Anjos on Dec. 13, 2014, and has three losses in his last five fights. He is 2-2 as a welterweight in UFC, losing back-to-back decisions to Dong Hyun Kim and Rory MacDonald in 2011. Diaz enters this matchup on a high note. The brash Californian defeated top 10 lightweight contender Michael Johnson via unanimous decision in a December contest that was awarded “Fight of the Night”. Nate Diaz is heavier than is opponent, plus he owns a three-inch height and two-inch reach advantage against McGregor. He has fought mostly as a lightweight, but the two fighters agreed to meet at 170 pounds since the new challenger will have just 10 days to prepare to get back inside the octagon, a full 25 pounds above McGregor's normal weight. z Diaz is a very talented fighter, skilled on his feet and on the ground, but when it comes to the stand-up game he's a lot weaker than McGregor. To pull off the upset, Diaz will likely be best suited staying on the defensive and hoping to catch his opponent in a mistake. Get 7/1 McGregor to win in round 1 - Risk-free! 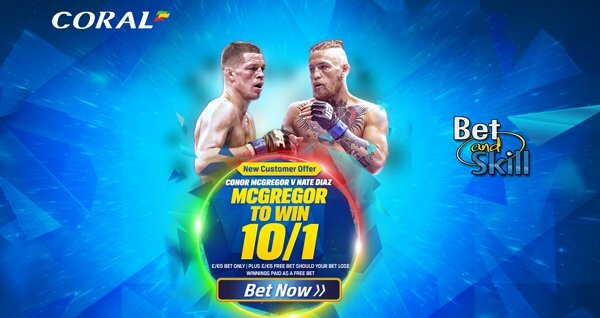 10/1 Coral McGregor to beat Nate Diaz + £5 free bet! Boosted odds! 5/1 McGregor to win + £5 if you lose! Enhanced odds - 7/1 McGregor to win in the first round! Price boost: get 3/1 McGregor or 12/1 Diaz to win (risk-free)! "Conor McGregor v Nate Diaz predictions, betting tips, odds and free bets (UFC 196)"